The origin of a badge on football shirts dates back to the first international match in 1872, when England adopted the now famous 3 lions. 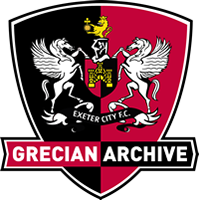 For Exeter, an assessment of the archives reveal that the club have had a number of different versions over the years, including various varieties of the city crest, a quarter shield ECFC badge, and a tidy ECFC monogram. Today the badge is closest to the original design, which draws from the Heraldic Crest of the City. 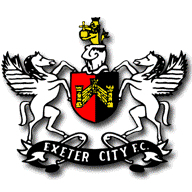 In the middle of the badge is a triangular and triple towered castle, which represents Rougemont Castle, while the winged horses are symbolic of the river Exe; both elements which are consistent with the traditional scheme of football badges that have symbols linked to the area that the clubs represent. Looking a bit closer however, the lion at the top represents Richard, the Earl of Cornwall, and the orb in the beasts’ hands signifies his title as ‘King of the Romans’… Now this makes sense given that Richard was once the owner of Rougemont, but is perhaps a touch ironic given that we are the Grecians of Devon.